Harman and Samsung are at the Geneva motor show demonstrating their collaborative approach to delivering the highly connected autonomous vehicles of the future. * A partner collaborationto further build on Samsung’s DRVLINE, its new open platform for automated driving. Each of these reflects the new scope and innovation of the Harman/Samsung automotive portfolio, which now blends Samsung’s global scale, R&D capabilities and consumer electronics expertise with Harman’s connected car heritage and know-how, industry relationships and community of innovation partners. Both companies are also making global investments in start-ups to help OEMs meet growing consumer demand for in-vehicle technology through scalable products that enhance the user experience for every vehicle segment. “With our scalable Digital Cockpit we are improving the in-car experience for drivers and passengers, bringing a much more intuitive, easy-to-use and visually-integrated approach to cockpit design,” said Dinesh Paliwal, Harman President and CEO. The Digital Cockpit platform includes a suite of flexible and scalable premium experiences that support today’s connected lifestyles without compromising safety or performance. 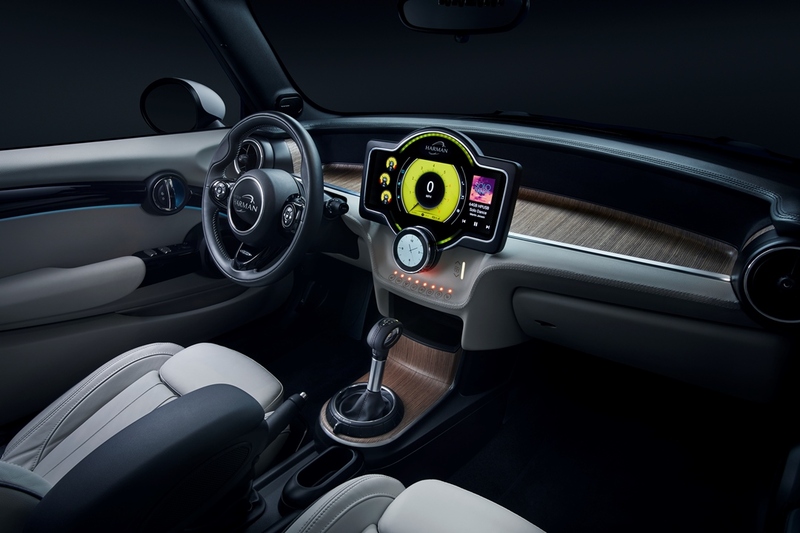 It’s available in standard and advanced system configurations and can seamlessly integrate the instrument cluster with centre console via voice, haptic feedback and physical knobs and steering wheel controls in a single, centre screen for all vital vehicle information and features. This also supports a multi-modal approach for interactions with different human-machine interfaces to allow customisation in terms of HVAC, media and user settings. The Digital Cockpit platform brings an entirely new generation of communication and ergonomics inside vehicles, allowing drivers to focus on the road ahead while intuitively and safely interacting with their in-car technology. This is made possible through a projection mode for services and apps via a user’s smartphone, allowing for increased personalisation. Greater IoT connectivity via cloud technology in the entry-level segment, as well as mid/high-level configurations, not only improves connectivity, but helps lower costs and overall vehicle weight. In a premium configuration, the Digital Cockpit weaves together a driver’s entire connected lifestyle across the Internet of Things. Through a multi-display layout that uses Harman’s Ignite Platform, the in-car user experience can be personalised for the driver and passenger via services such as virtual personal assistants, portable profiles, augmented reality and more. This also allows for the Android OS to be integrated on four displays – a first for the industry. Focused on a future generation of shared mobility, the premium Digital Cockpit personalises occupant experiences, so drivers and passengers feel like the car is theirs even if they don’t own it. By using the phone as a key service, the system can automatically access subscription services associated with user profiles while Bixby offers intelligent personal assistance to help occupants complete tasks by voice, touch, gesture and context-based triggers. The Digital Cockpit is scalable and made available for every automotive segment, offering future proof and safety focused features within a developer-friendly open network. Harman and Samsung are jointly developing modular approaches for advanced telematics, capable of 1 Gb/s bandwidth. Harman and Samsung will deliver the industry’s first 5G-ready automotive system and multi-band conformal antenna to enable secure, fast and reliable data communications. This consists of a telematics control unit with a modular design accommodating a network access device (NAD) supporting LTE CAT 16 connectivity today and 5G in the future using the same hardware design. 5G represents a large leap in the future of mobility. In the automotive sector, 5G delivers safety-enhancing V2X capability that is an essential enabler for autonomous transport. 5G speeds up to 100X faster than current 4G LTE standards to provide incredibly fast high-resolution streaming, immersive virtual and augmented reality features and seamless cloud-based applications in fast-moving cars. Ultra-reliable and with low-latency response times of just 1ms, 5G enables V2X and cloud-based computing and storage for the next generation of autonomous vehicles. At GIMS 2018, Harman and Samsung are demonstrating high speed connectivity in a future mobility concept vehicle powered by the Samsung Networks 5G infrastructure. Developed in close collaboration with Harman, Samsung is showcasing at Geneva its new DRVLINE platform, an open and modular platform for autonomous driving designed to scale from Level 3 automation up to Levels 4 and 5. The two companies will continue to focus on engineering, high-performance computing, sensor technologies, algorithms, artificial intelligence and cloud & connectivity systems that are scalable and capable of lower-level autonomy through to Level 5. The first Harman/Samsung-developed ADAS product will be a forward-facing camera featuring lane-departure warning, adaptive cruise control, collision warning and pedestrian warning algorithms. The new system combines Samsung’s heritage in camera technology with Harman’s ADAS 360 product that blends machine learning and data science with augmented reality to create a self-learning virtual co-passenger to ensure the connected driving experience is personalised and safe. The new system will begin shipping in 2018.